Home » Editor's Corner » How To Make Fun Runs…Fun! I read a recent SportsEvents article about the sports commission in Louisville, Ky., adding lots of “Fun Runs” to their inventory of sports events, and I started to wonder what really makes these runs so fun. 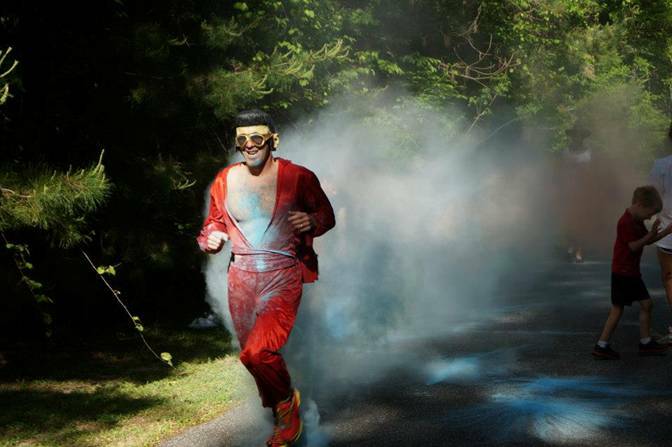 After putting on a run where runners were splattered with powder paint at every mile and people said they had an absolute blast I reviewed what we had done well and asked others who had participated in other fun runs what had made them so fun. To mock the real estate sales people you need three things—volunteers, volunteers and volunteers. You need lots of people. You need lots of loud, enthusiastic people. I can think of two events I went to where volunteers were quiet, unenthusiastic people who were supposed to be giving very important directions using loud, loud voices and exaggerated body language. Because the volunteers did not possess either of these traits, athletes missed their turn or ran into other athletes or course hazards. My advice is to specifically recruit groups or individual volunteers who will be loud and enthusiastic. Our paint splatterers were teen-aged members of a swim team. They were naturally loud and expressive, but I encouraged them to be loud, silly, wear costumes or do whatever they wanted to create enthusiasm. The only other thing I told them was that we were going to be socialists with the paint. Everybody got the same amount of enthusiastic attention as they would give their best friend. Lack of hydration and nutrition is a problem I have heard too frequently among runners. Organizers simply have to have more than you can imagine they might need. You might even attract untrained runners or athletes who will be on the course longer than some others, so having plenty of water on the course is really imperative. Don’t offer enough hydration, and you will definitely give your fun runs a non-fun feel. An enthusiastic announcer and music everywhere is extremely energizing. Plant cheap boom boxes along the course. Have cheerleaders and drum corps from high schools and middle schools playing along the course. Many of these groups are looking for opportunities to perform. Be creative. Have jugglers. Have bears on unicycles. It is a FUN run! Oh by the way, I had Elvis on a bike lead out our run. And yes, the lead runner kept challenging him to a race so halfway through our race Elvis threw down the bike and we had a mile and half duel between Elvis and a top high school runner. Top that for a FUN run! Paul Peavy is a Licensed Psychotherapist who has found a unique and energetic way to help people. As a former stand-up comic he knows one way to get people unstuck is to get them to lighten up, laugh, and live! In over ten years of dedication to getting people moving toward rediscovering the joy in life here are some of the highlights of America’s favorite Stand-up Therapist! Paul also competes in Ironman triathlons with his wife. Kid Volunteers? Yes, No Or Maybe?